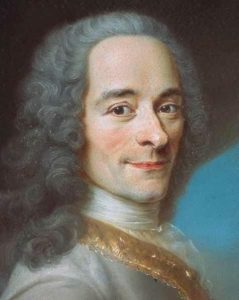 Voltaire, apparently, popularised this aphorism: “The enemy of good is perfect.” As with all good philospophy, the longer one thinks about such a concept, the deeper the understanding becomes. It is useful to consider this in the preparation, delivery and reflection of presentations. In the construction of a presentation balance is essential. One should spend a good amount of time on each section, p1, p2 and p3. Many presenters short change the p3 time by spending too much time in the preceding planning and construction sections. The value to the audience is in the complete package and whilst improvements may be wrought in story, supportive media by further work it is more important that the delivery is practised. The enemy of good is perfect in preparation. No presentation is ever perfect. In fact, the best practise session may be better but it is important during delivery to remember that the best version of the presentation the audience will receive is the one being delivered. The audience has no opportunity to review plans, scripts, better slide sets or previous practised versions; the presentation delivered is the best presentation. Whilst a presenter may be disappointed by a flaw in the story p1, a formatting issue with the p2 or a lapse in the delivery p3 the good presenter must move past that and focusing on continuing to deliver as good a presentation as possible. The enemy of good is perfect in delivery. Reflection on the value of a presentation by a presenter is often based on self reflection. This is an error. As discussed above the presenter may have views of what should have happened but the audience are those who deliver proper reflection. Sadly some presenters hold the former approach and fail to see how good a presentation actually was in their pursuit of how perfect it might have been. This is unhelpful. A trusted and pre-warned ally in the audience is of value after the event to help in a more structured and formal technical debrief but it is important not to devalue a presentation simply because the presenter didn’t feel it was perfect. The enemy of good is perfect in reflection. No presentation is ever perfect. Whilst this should encourage practise and reflection and endeavour to improve it is important not to sacrifice practise in pursuit of perfect construction; not to sacrifice delivery in the face of a mistake or to sacrifice praise and audience value in pursuit of personal excellence. Perhaps good is actually pretty amazing, just not perfect?